Could it be something with a camera, perhaps? Sony Ericsson has revealed a quartet of clues to it's "big" and "exciting" news for CES 2012, consisting of camera-related pictures. We've got a close-up of the camera shutter button on a graphite-coloured handset, a shutter close-up with HD marked below it, an onscreen still/video option key and a microSD port to feast our eyes upon. 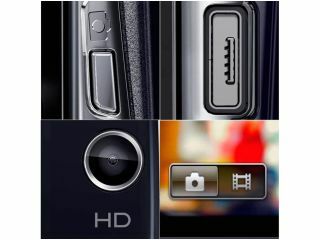 All these camera-related tidbits tie in quite nicely with the 13MP camera we're expecting to see on the LT28at but more likely its pointing to the 12MP snapper of the Sony Ericsson Xperia Arc HD. As the eagle-eyed bods over at SlashGear point out, the images all bear similarities to the Xperia Arc S which lends further credence to the Arc HD theory (and the fact that one of the pictures actually says HD is a bit of a clue too). Sony Ericsson's tantalising pictures were posted to the company's Facebook page after the last tease was publisehd on Google+ - will a Twitter clue complete the social networking big three? Whatever else happens, you can be sure that we'll find out all there is to know at CES 2012 next week.